I suppose we are getting used to reports of Western wildfires, but the Yosemite rim fire is a bad one. It doubled in a couple of days to burn 125,000 acres by Saturday, and the 2800 firefighters have so far achieved 7% containment. Nor is this merely a story about the loss of natural beauty, for the fire is threatening San Francisco’s electrical grid and water supply. 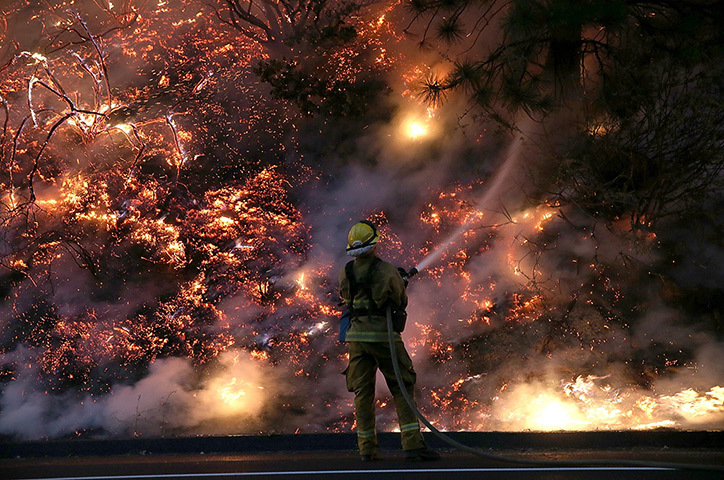 Given the large scale and destructive potential of the fire, the pictures from the fire line can seem mundane: guys walk along spraying liquids, either to put out spot fires or start back fires, while above them the monster is creating its own weather pattern that can send it in any direction. And yet there is one photo that, as improbable as a downdraft, leaps into the imagination to communicate something deeper still. Not surprisingly, it also is a photograph about beauty. I don’t know which is more striking: the radiant tree branches or his nonchalance in the inferno. It almost seems that he is spraying paint on a canvas, or washing a mural, or waving a magic wand that is creating the luxurious tableau before him. Some critics might object at precisely this point: the fire has been completely aestheticized, they would say, with any sense of danger or moral significance–and of public response–displaced by the pleasures of spectatorship. And they might seem to be right, for the fire does seem to have become a painting of a fire, an event so fictive and distant that the balls of white heat triangulated around the man could be distant galaxies. The image seems to speak to art history–is the influence Japaneese, or Romantic, or from a video game, or . . . ? It does not bring to mind climate change, environmental politics, or emergency funding. And yet, it is beautiful, isn’t it? Both the fire and the photo are dazzling and enthralling, strange and enchanting. More than that, the photo doesn’t hide its art; instead, by emphasizing the aesthetic distance and coherence of the scene as well as its elements of incongruity, it makes the beauty of the fire an object for serious contemplation. That prompt can be taken in several directions: for example, one might consider how all disaster photos draw on artistic appeal or manipulation, or how beauty is agnostic about whether sequoias are green or aflame, or how human beings have a rather complicated relationship with fire. Or, to quote Walter Benjamin, how humanity’s “self-alienation has reached the point where it can experience its own annihilation as a supreme aesthetic pleasure.” That degraded relationship would seem to be demonstrated by the firefighter in the photograph: standing apart from the scene he actually is in, enjoying the view while casually hosing down an environmental disaster that one way or another will eventually engulf the planet. His indifference mimics our own, while we can pretend that the conflagration isn’t real simply by being spectators. But he may not be enjoying the view. and Benjamin’s observation may be applied too easily today. I think we need to look again. Nature, like the photographer, could be telling us something–something still inchoate, beyond ready verbalization, and essential. Something about the close connection between civilization and catastrophe, for example. Whatever the message, I’m sure that the key to understanding is to value the beauty of the image, rather than try to contain it. Photographs bt Justin Sullivan/Getty Images.